Corey Vol 1. is the first solo endeavor by Duma Love, former percussionist, beatboxer, rapper of Cibo Matto. To paraphrase... Duma has traveled the globe playing music, performed on The David Letterman Show twice, recorded with The Beastie Boys and more. 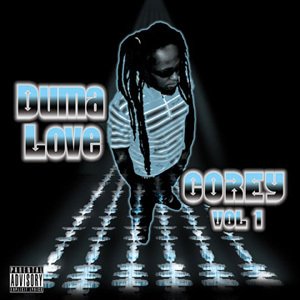 Duma is widely known for his underground rapping abilities from previous projects, Corey Vol. 1, however, is much more mainstream than any of his other works. The listener will be surprised and delighted by the Urban Gypsy's melodies and hypnotically tight flows. With hooks that grab you the first time you hear them and verses that make you want to sing along, we feel Corey Vol. 1 will be your new favorite for quite awhile. To ensure the success of this debut release, Intolerance Records has implemented a full scale campaign including television and radio spots, major and college radio play, an elite Internet marketing strategy and a well established grass roots street team. In addition to electronic downloads at all major online retailers, Corey Vol 1. is also available in physical CD format and distributed at brick and mortar retail outlets. Check out Corey Vol. 2 for more Hip Hop, Remixes, Rock, Acoustic, Classical Guitar and other unique examples of Duma Love's musicianship!